Tiramisu is one of my favorite desserts, this dessert has all the flavors in a different form, how can you resist the creamy, chocolatey, coffee goodness. I took this wonderful dessert and played with it creating a mascarpone gelato flavored with marsala wine, then made chocolate espresso madeleines, a recipe I adapted from the great Gale Gand,I made the recipe as written except that I added the powdered espresso, cut them in half filled with the gelato and served with a chocolate, espresso kahlua sauce. You can make the gelato the day before so it has time to freeze, the madeleines take only a short time to make. I feel its best to put these together when you will be serving. You can bag and freeze the madeleines that you do not use and play with the proportions for the chocolate espresso kahlua sauce making as much as you need. Heat the cream and milk to scalding, beat egg yolks and sugar until they are thick and creamy and a beautiful light yellow color, slowly add half of the hot milk/cream whisking constantly (You are tempering the eggs) pour back into the pan with the rest of the hot milk and whisk together. Cook on medium heat stirring constantly until it reads 175 on the thermometer or until its thick and coats the back of a spoon. Pour into a container and at this point you can do one of two things, refrigerate covered with plastic wrap that is resting directly on the custard or you can place in an ice bath to cool. Once it is cooled add the vanilla and marsala, stir to combine. Whisk in the mascarpone until its smooth and there are no lumps. Pour into ice cream maker following manufacturers instructions. When its the consistency of soft serve ice cream put in a container with a tight fitting lid and freeze until it’s scoopable. Preheat oven to 325 degrees. Brush madeleine pans well with 4 tablespoons softened butter; refrigerate 5 minutes. In a small heavy-bottomed saucepan, melt remaining 1/2 cup butter over medium heat. Continue to cook until butter turns golden brown, being careful not to let the butter burn. Remove from heat and strain through a fine mesh sieve into a small bowl; set aside. In the bowl of an electric mixer fitted with the whisk attachment, whip eggs with granulated and brown sugars until light and thickened, 3 to 5 minutes. Add flour, cocoa powder, baking powder, and salt, and stir on low speed until combined. Add vanilla and reserved browned butter; mix just until blended. Insert a 1/2-inch plain tip into a pastry bag and fill with batter. Pipe mounds of batter into prepared pans until each mold is full, mounding batter in the center of the molds but not filling to the edge. Alternatively, you can use a teaspoon to fill the molds with batter. Bake until madeleines are firm and a little mound is puffed up in the middle, 10 to 12 minutes. Madeleines are best eaten the same day they are baked. Heat cream and sugar until the sugar is melted. Remove from heat and stir in the espresso powder, kahlua and chocolate let sit for a minute or two and stir to combine. 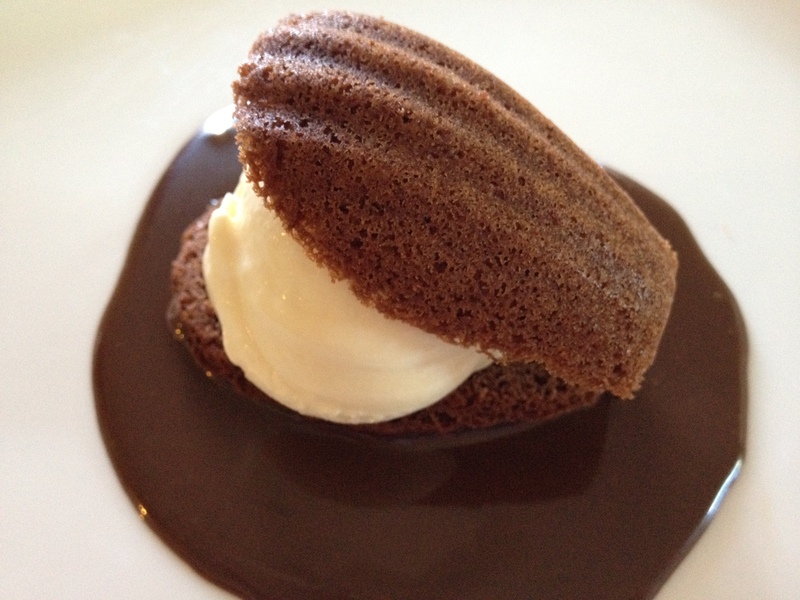 Spoon some of the chocolate sauce on a plate, lay the madeleine filled with gelato on top. Nom nom nom nom… how I love Tiramisu! Thank you so much, I’m sure purists will be rallying that I shouldn’t even use the name but it has all the flavors and is such an easy one or two person dessert freeze all the components and serve as much as you need. I love it, but since I am solo here except for the pugs, it’s way too much for me making a whole one so I thought I would give this a try, it’s got the flavor and I can take a madeleine out of the freezer when I want it. It’s a viable solution when you live alone. Thank you so much. What a fabulous idea! Suzanne, you’ve hit this one right out of the park. Thank you so much, I will in turn pay it forward! Me too! this has the flavors but not the form, really good though. The madeleines are fantastic. I love tiramisu. That thick, creamy texture is pure luxury. I think this is a very interesting twist on the idea.